It's Monday and it's time for a new Genius. I know she's going to be a familiar face to many because she is just that awesome . . .
Can you love someone you only know on the internet. I'm going to say yes because I absolutely love this woman. She is kind and encouraging and basically the funniest person I know though text. If you've never been to her blog , Djkardkreations, you're missing out on one of the gems of the internet. 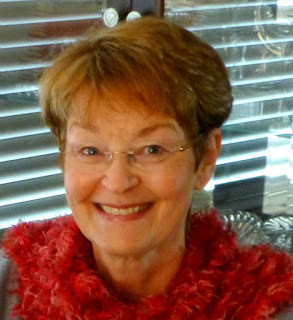 She's also super talented in her card making which is like the cherry on top of the cake that is this fabulous woman. let's get to know her better so you can fall head over heels for her too . . I'm Darnell. I'm a stamp addict and a blogger. I live in the Bay Area of Northern California. Clean and simple, sometimes ridiculously simple, and sometimes punny, funny, or whimsical. Anything having to do with watercoloring. 4. What was your first crafty purchase? Would you still buy it now? Was and always will be Anne Murray's Christmas Wishes. I'm a man. No, stop it. Hmmm, before I became addicted to stamping, I used to roam antique and second-hand stores for three collectible passions: Heisy glass, blue/white china, and first edition books, especially poetry. I still have my favorites. Do you see why I love her?! She's my tribe that one. Kathy Bates. Fantastic. Speaking of fantastic let's look at some cards! Hello Beautiful! I just think this watercolor piece is stunning. Have you ever seen more perfect embossing?! Seriously black on white is hard to pull off with such clean lines. Those little pops of red are the perfect way to draw the eye. 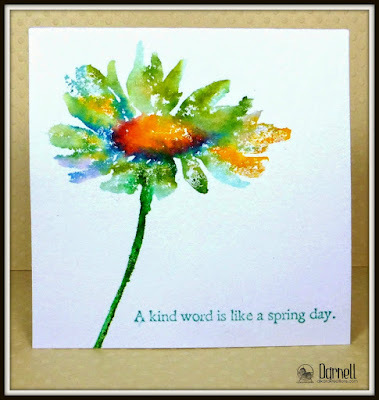 I really loved the watercolor flower Darnell used in her first card. I decided to use a cluster of flowers because her second card included a stem with several flowers on it. 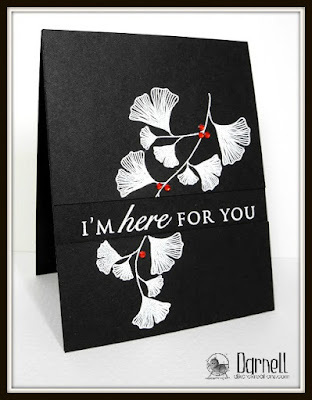 I included some white on white embossing like Darnell did in her third card. I loved the way she split her sentiment on the second card and used a large script sentiment to split my panel to mimic it. If you'd like to enjoy the edited video click the link above! If you'd like to enjoy the unedited video for the card below click the link above. Thanks you so much for visiting me! Go visit Darnell too and leave her some love!! 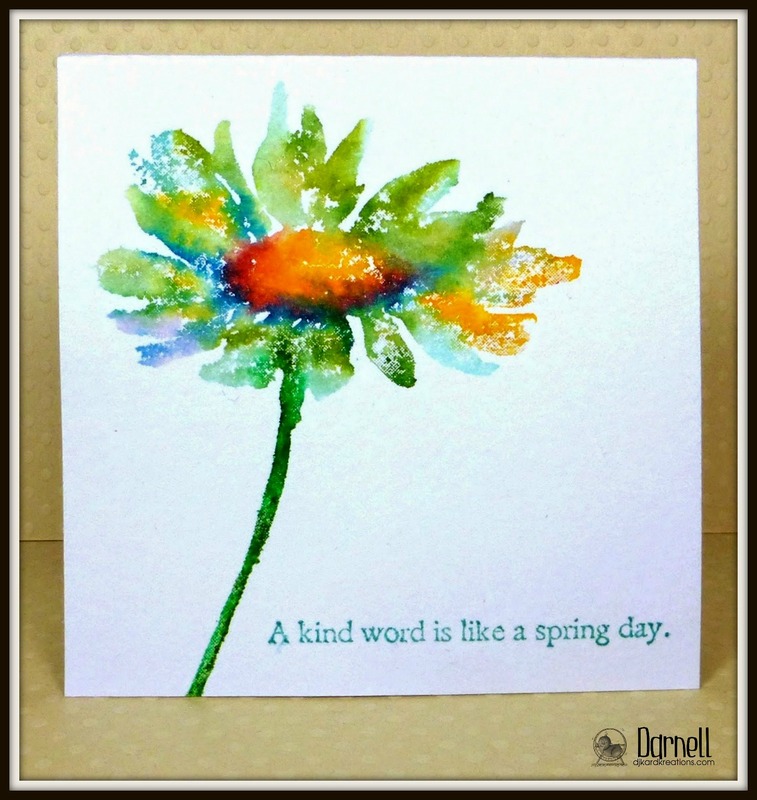 love your feature on Darnell - and love seeing you do the same card in different mediums - my fave is the watercolor - so soft and pretty. Loved both versions, but preferred the edited, only because I have limited internet. Darnell was the perfect choice! Love that lady...she is so talented, and witty! Thank goodness she has Hammy to keep her in line, or she really might say a cuss word now and then! 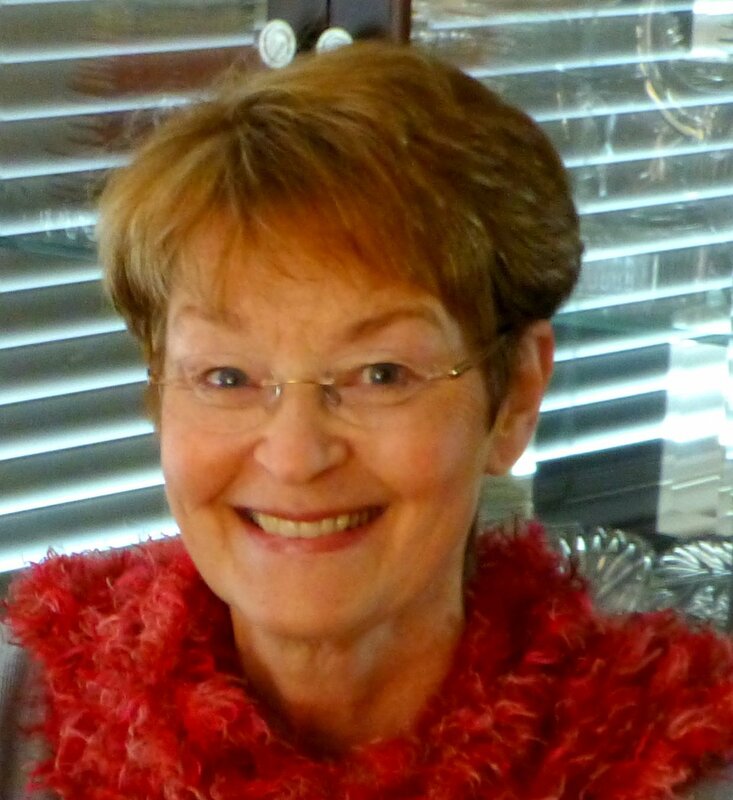 I'm your newest follower-great blog! YAY for Darnell!! Love her and her cards! And your two CASE's are gorgeous, Kelly! Watched both videos. I do lean a little towards the edited video vs the unedited...but both are great! ;) And boy, if I had a quarter for every time someone said "oh, like hallmark cards"...lol Thanks for sharing! We all know Darnell and we all love her and her cards! Great choice to CASE! Your cards are stunningly gorgeous, as always! And Happy Birthday, Kelly - hope you have a great day! Coming back to watch the videos - there are a lot of 'how did she do that's in my head right now! Yay for Darnell! Love her work! Fabulous caseing too! So nice to see Darnell featured here! Your case'd cards are beautiful! Fantastic Cason of Darnell! I chose to watch the edited video because I have limited free time. Thanks for sharing your card making process. Darnell is funny and love these cards! and p.s. Happy Birthday, Kelly! The a2z DT wrote you some wishes on the fb page and Linda suggested we pop over here instead, so HAVE A GREAT DAY! ok, here's the review. 1. I love your videos and cards. 2. I like the unedited for the repetition of coloring. As in, I can see how you made flower after flower and that's helpful. 3. I also enjoyed your humor and chatting...but I think it comes through in the edited version too. 4. I didn't watch the whole unedited piece but I watched a lot of it. 5. I think if you do unedited you'll have a specific audience who just wants to hang out with you :) b/c that's what it's like. 6. Last thing, do what you prefer and people will find you. If you're tired of chatting so much, don't. If you hate the editing afterward, don't. If you're enjoying yourself, we will too! and oh, p.s. you got mad coloring skills, my friend!! Fabulous case's no surprise there. Love Darnell's blog and sense of humor...you two have that in common. I love both cards equally...normally I would have picked the watercolor...just because I love watercolor looks...but you have helped me to rediscover the copic's. Your coloring and vibrant beauties are just breathtaking. Seems its your birthday, so have a fabulous one. Off to watch some youtube! I'm such a fan of Darnell's...so talented and Sweet!!!!! Awesome cards and whoa Kelly love your cards! Darnell has so many adoring fans, and I am certainly one too. :) I liked the unedited version, Kelly. I want to catch every nugget of info that can be sucked out of your wildly creative mind!. :) Beautiful cards. Yep. Yep. TFS!!! Love both videos! is there any way you can do them both? I watched the short one when i was getting through my subscription videos on techniques... but i put the long video on for when i worked on my own coloring and i loved it! It was like you were there coloring along with me :) Thanks for the great videos! Happy Birthday friend!! Hope you're having a wonderful day! Love your case and Darnell's gorgeous cards! I'll take a look at the videos and let you know. Typically I like shorter videos since I don't have lots of extra time. I am so happy that you showcased Darnell!! She is a HOOT!! I have to say that I love your videos and it is not the length that really matters. I love to hear you talk, make little side comments, see that you too make mistakes AND learn how to save your card after all the work that you put into it. It makes me feel like I am "normal" an makes the video a piece of you-your personality and I LOVE that!! Thank you for showcasing both techniques. It is cool to see the same stamp with two different mediums. So very delighted to see Darnell featured! Your case of her card is awesome! I loved the videos and the chat too! Well, Great CASEs of Darnell! Love seeing the sweet and fabulous Darnell here today!! Your CASE of her marvelous work is stunning!! OH shoot, I'd hoped to comment before Darnell did... she is THE Bomb-diggity. Enough said. She is D to my M and makes me smile, giggle, and sometimes guffaw... yes she's that good. Long.....short......matters not! I've always got coffee going and you can be quite entertaining. 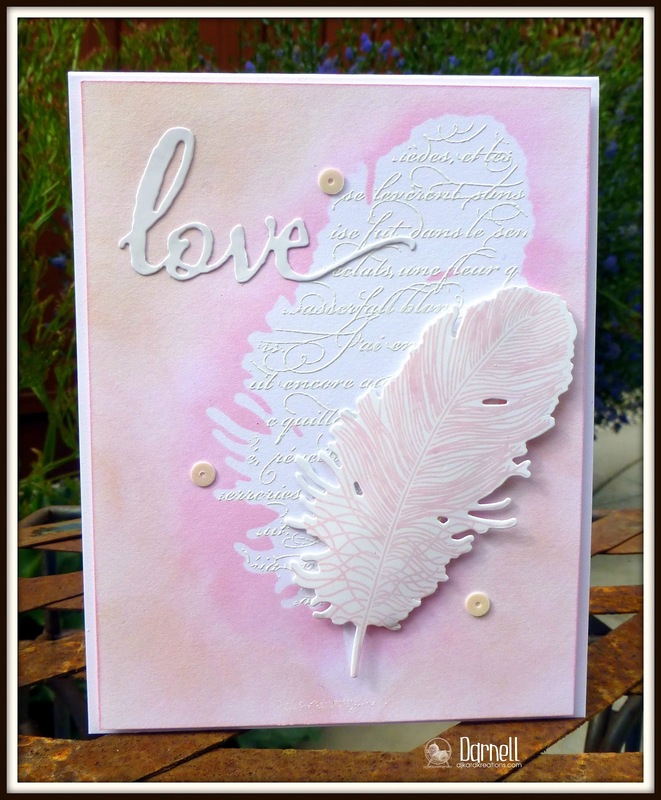 I love the watercolor card with the Zig pens and embossing. Happy belated birthday! Well, you couldn't have picked a more wonderful person to CASE this week!! Like you, I absolutely love Darnell. We will probably never meet (unfortunately) but would love to one day. Her cards are gorgeous and clever and her blog so delightful. Everyone who makes cards and reads blogs should follow her blog!!! Brilliant CASe I love Darnell of course as she was the one to give me the nudge in the right direction, Flickr then a blog. Always there with helpful hints and lots of praise, making ohh so much difference to ohh so many people. Thanks for that Kelly. 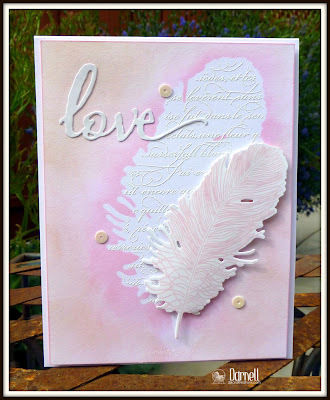 Love Her cards and had forgotten the love one with the soft pinks and the feather, must give that idea a go. My goodness your CASe both cards blow me away but I also have just received my Zigs so any help much appreciated. Happy with either long or short but probably easiest with short time wise. Long is great cause we can really see the steps especially if new to a technique but I reckon most people are more likely to take the time to watch a shorter one than a long one. Love the cards! I prefer the edited version. I did watch some of the unedited by sliding the button to see it quickly, then stopping at certain spots along the way. I LOVE the watercolored look the best. I also like the shorter video best just because of time. This is as bright and lovely as our Darnell! Awesome CASE, Kelly! I loved both of your cards. Very cool to see both techniques. What digi stamp is that - I really like it. Ok, well - that was so fun to get to hear you and watch you do your thing!!! The edited video was more my speed because that is about how much time I have to watch a video and like some other people have said - in that one you used Zigs, and I have those - I don't have Copics!! So therefore I liked watching you use those!! I learned so much about shadow and color and everything from watching both!! But my favorite video was the edited one where you used the Zigs!! I was so right about your amazing talent!! YOU FLOOR ME - I CANNOT BELIEVE HOW AWESOME YOU ARE!!!!! And it was so fun to learn more about Darnell!! Happy thing that you so - the whole CASEing Genius thing!! Love ya and think you make masterpieces!!! Kelly, I prefer the edited version because it is more suited to my schedule. But I prefer the Copic version of the card. What I enjoy most about your videos is that you do show us things in real time. Too many tutorials speed up the videos so much that I don't learn anything. I enjoy your rambling commentary because that's the way my mind works and it seems very natural to me. Thank you for a unique and entertaining approach to card making. I quickly became a fan! I watched the edited video and enjoyed it; it was long enough for me. Thanks for the chance to win. Enjoyed your comments and tips, too. Thanks for featuring Miss Congeniality (everyone's Favorite). So far I have watched the watercolors version which was informative. I liked how you used a bit of liner pen. Next I will watch the copic version as I am a Copic Girl. I thought the 18 minute one was the LONG version, but when I looked for the edited version, I found the 52 minute version! For me, the 18 minute one is more in line with my available video-watching time. I'd never make it through the other one. I did learn shading and more from the edited one, so thanks. And thanks for the chance to win the MarkerPop certificate. Ok so I love coffee and coloring. So yes I chose the unedited version, and loved it! !